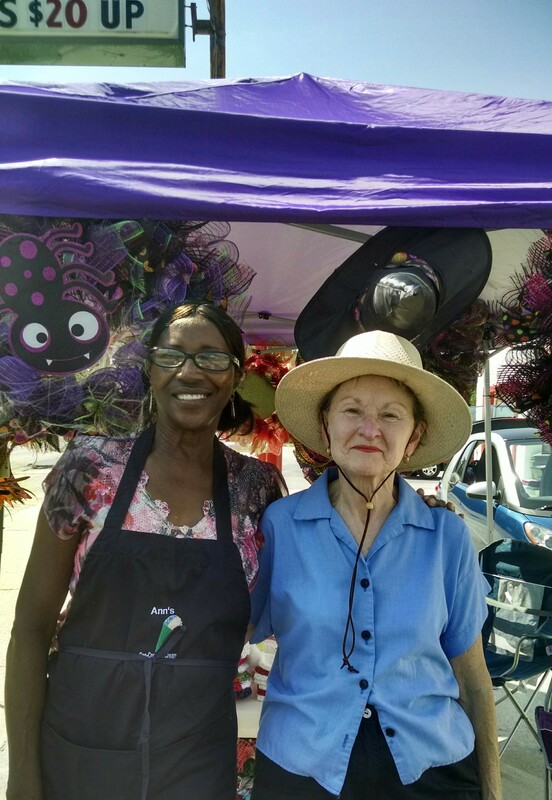 Meet Ann from Ann’s Ice Cream and Sno-Cone Shop and Lila. Ann, I have spoken of in previous blogs. She is a lovely lady and I have such a great time with her. Our friendship has grown during these past summer months. Nesting By Robin’s tent sits next to her shop and believe me, Angie, (my daughter) and I have enjoyed our share of ice cream. She sells the best ice cream (Hershey’s) and more flavors of sno-cones in all of Fayetteville. The Cappuccino Crunch is my recommendation for ice cream. Can we say AWESOME! Lila is a great lady. She had heard me on the radio this past Saturday and came to check out our booth. She was so sweet. She pulled up a chair and sat with me for two hours in 90 degree weather keeping me company. We learned a great deal of one another during those two hours. I truly hope she will come visit again. While we ladies were having a great time chit chatting and I was waiting for my daughter to return, we heard of a horrible auto accident not far from our location. I became alarmed when I had learned my daughter was driving back around the time the accident occurred by the bridge. God was so good, another friend of mine from church stopped by the booth and told me she saw Angie out directing traffic by the accident. She was not involved in the accident but had witnessed it. Another active four hours on Nesting By Robin’s favorite corner. I love setting up the booth because I never know what God has in store during the time we are there. I do know special friends are being made. Until the next time, may God bestow upon you abundant blessings.